Good morning everyone! I know most of you are planning a Juice Fast for the beginning of the month of January. I am hoping to join you there tomorrow. I am planning to try the Prolon 5 day fast starting on the 7th of Januray and this may be a good way to head in to a full fast. Afterwards I plan to get back here and start sharing recipes with you that I make and find great. I hope many more people will join this group after they finish their own reboots so we can support one another. I did very well this year with my goal of just maintaining my prior weight loss and then in September I decided to go full on vegan and weigh daily,and began to watch the scale go down again slowly. 2019 is the year for me to meet my goal, followed by a 2020 maintance program. I am hoping to reach my goal weight by September at the latest. I want to lose slowly as I find it comes back on faster if I don't go for a 5 month maintenace period after I reach my goal. I am aiming for a 25 lb weight loss to get to goal. Wishing you all the best in reaching your goals for good health in 2019. I am off for a run! Hi Leslie, I've been coming and going on this site for years now. I always enjoy reading your posts. I like the way you have outlined your goals. You're right, of coarse, about losing weight slowly. I believe it is sustainable that way. I will be rebooting soon and then hope to find some of your healthy recipes here:) Have a great new year! Good morning everyone going to reproduce the lentil walnut loaf for New Years. Then hope to start a prolon fast by the 7th of January, followed by a juice/broth/tea fast into February then repeat the prolon fast for 5 days before we head to the Bahamas for our friends wedding. We shall see what happens, my mom is considering bladder suspension surgery, and I have been trying to encourage her to do this for months. I got a waffle maker for Christmas! Best Ever Vegan Waffles How to make the Best Ever Vegan Waffles! Nice and crispy on the outside, soft and fluffy on the inside. Plus, they're easy to make (1 bowl) and use ingredients you likely already have in your pantry! Make the Flax Eggs: In a small bowl, combine the ground flax and water. Stir, and set aside to thicken. Make the Vegan Buttermilk: In a large measuring cup or bowl, measure 3 1/2 cups of soy milk. Add the apple cider vinegar, stir a little with a spoon and set aside to curdle. Add the flax eggs, vegan buttermilk, melted coconut oil and vanilla to the dry ingredients. Stir until just combined with a large wooden spoon, being careful not to over mix. The batter should be fairly thick, if it's too runny add a few tablespoons more of flour. If it's too thick, add a little more water. Spray waffle iron with oil (unless your waffle iron is non-stick). Pour the recommended amount of batter onto hot waffle iron, and cook until the waffle is golden brown on both sides. Serve immediately, or keep in a warm oven (200 degrees F) until ready to serve. Top with fresh berries, coconut whip, vegan butter, maple syrup and anything else you desire! May use coconut, almond, cashew or any other kind of non-dairy milk that you wish in place of the soy milk. I like that soy milk adds some protein, since my kid's have these for breakfast often before going to school. These definitely taste best with some white flour, but you can make them with all whole wheat flour, white whole wheat flour, whole wheat pastry flour or even spelt flour. I haven't tried a gluten free flour. If you don't have coconut oil, you can use melted vegan butter or canola oil. They all work just fine. These waffles freeze beautifully. To reheat, simple pop them in the toaster until warmed through and crispy. I always have waffles in the freezer! These make 8-9 large Belgian waffles, but if you have a smaller square waffle maker, they make around 22 waffles. I used coconut sugar but even that is not very healthy, plus you only eat 1/20th of that with the amount of waffles my small waffle maker produces. You could substitute a product like swerve available at Thrive but I am uncertain as to how healthy or tasty it might be. Check it out and let me know what you think DiAnn, or what you would replace it with. swerve Plus I would be making waffles for a kid and to with pure maple syrup of which I have control so he would not over do it. From Eating Well. This looks easy. 2Remove the stems from the portobello mushrooms. Set the caps aside and chop the stems. 3Lightly brush the portobello caps with 1 tablespoon oil. Sprinkle with ¼ teaspoon salt and ¼ teaspoon pepper. Place on a rimmed baking sheet and roast until soft, 10 to 15 minutes. Keep warm. 4Meanwhile, heat 1 tablespoon oil in a large skillet over medium heat. Add sweet potato and water. Cover and cook, stirring occasionally, until just cooked through, 6 to 8 minutes. Uncover and stir in remaining 1 tablespoon oil, the chopped portobello stems, apple, bell pepper, shallots, poultry seasoning and remaining ½ teaspoon salt and remaining ¼ teaspoon pepper. Cook, stirring, until soft, about 5 minutes. Stir in walnuts and parsley. Fill each mushroom cap with about 1 cup filling. 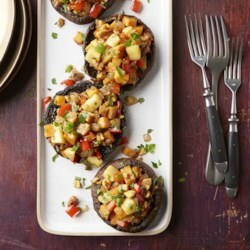 Thanks for sharing I love portabella mushrooms! Good morning feasters! Lol, I made enough juice to get me through the next 3 days with an evening meal. I had juices during the morning and afternoon, then I ate the leek and potato soup I made when we got here with a side salad. I added about 1/2 cup of wild rice to the soup to change it up a bit, it was all filling and delicious. Not sure what I will have today for dinner I need to think about it and go to the store. right now the fridge has food I brought with me, plus what Mark bought. I do have some lentils thawed for a side dish, and some salad fixings. Time for a recipe hunt! Hello all! Do you have an instant pot Soose? If so I recommend making a big batch of lentils and also a big rice that you can portion in to smaller containers and freeze. Then they make an easy defrost and heat side dish for the family. I love my instant pot, you can cook winter squash in just minutes. And I have been making soups and other foods as well easy clean up too. When I get home I will share some of the recipes I made recently. When we got here I made a leek and potatoes soup, Also my vitamix has a soup button and I have used it to puree vegetables and it makes a hot soup in about 3 minutes of blending. I used this recipe:Potato Leek soup I substituted a product called better half for the half and half which is made with coconut cream and almond milk but you could make it with any nut milk and I als used vegetable broth instead of chicken. I did not garnish it with anything and it was good. I really like some ot the recipes in the Oh She Glows cookbook and you can find some online (Angela Liddon). You can look over her recipes here and see it any are easy ones recipes I see she also has a plant based app for the phone. I will have to look in to. I am glad to see that you are back here again Soose! I am looking forward to going home but we are here until Saturday, Then home to get food for Christmas and wrap the gifts that came after I spent the day wrapping before we left. I ordered a lot of girl stuff for Poet when we heard she was coming to Christmas dinner. I am looking forward to a juice fast again at the first of the year for a couple of weeks and using the instant pot to cook some freezer friendly meals and soups during that time so I will be ready for an easy transition back to eating, using some of the IF techniques I have been learning about. I also follow Vegan in the Freezer and the Edgy Veg they have some good recipes if you do a google search their recipes will pop up. I think if you can get the student to help out, you may have that student do some recipe prep for you and place the foods in containers in the fridge so you can just grab the items you need and cook them. Want to make a version of these. Hi Soose! Sign up for these daily emails. www.truenorthhealth.com This is a place where people go to get well in California. I've heard some amazing stories. Chef AJ talks a lot about this place. I just got their recipe book. Did you see Joe's recipes?